ATLANTA, GA, February 07, 2019 /24-7PressRelease/ -- Designed to spark greater faith and fulfillment in key relationships, the founders of Spirit Led Publishing & Printing Group are releasing "The Guide" on Feb. 22, with pre-orders now available. 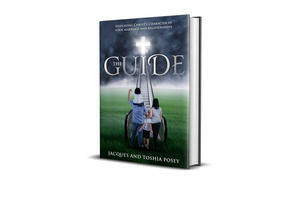 The brand-new book by Jacques and Toshia Posey helps couples bring the characteristics of Christ into their marriage and other important relationships; the duo previously co-wrote "Spirit Led Marriage: Our Journey." Featured in rollingout and VoyageATL, among others, the Poseys recognize that couples who are active in their faith together are more likely to stay married and to stay happy in their marriages. More than half of "very happy" couples agree that God is at the center of their marriage, according to Christianity Today International. Founders of Spirit Led Ministries, the couple launched Spirit Led Publishing to promote more positive, affirming messages in publishing and to support writers with services such as editing, formatting, ghostwriting and promotion. "We love working with writers to help them shape their messages, and realized that we, too, had a wonderful message to share, as Christ has played a central role in the growth of our relationship," said Jacques Posey. "We felt called to share more of the story of how our faith are beliefs have become such a critical part in our successful marriage and our business relationship." "The Guide" offers tips and tools that can also be used to bolster friendships, work connections and family relationships. "When you work with your spouse, it is that much more important to be on the same page when it comes to issues such as faith, work/life balance, priorities and time management. We are so proud to have launched these incredible businesses and so pleased to share our story and encouragement in 'The Guide,'" added Toshia Posey.